Kenji Ohmori (Institute for Molecular Science, National Institutes of Natural Sciences, Japan) and a group of collaborators have developed the world's fastest simulator for the quantum mechanical dynamics of a large number of particles interacting with each other within one billionths of a second. The dynamics of interactions between large numbers of electrons govern a variety of important physical and chemical phenomena, including superconductivity, magnetism and chemical reactions. An ensemble of many particles thus interacting with each other is referred to as a "strongly correlated system." Understanding the properties of strongly correlated systems is thus one of the central goals of modern sciences. It is extremely difficult, however, to predict theoretically the properties of a strongly correlated system even using the Japanese post-K supercomputer, which is planned for completion by the year 2020. For example, the post-K cannot even calculate the precise energy, the most basic property of matter, when the number of particles in the system is more than 30. Instead of calculating with a classical computer such as the post-K, an alternative concept, a "quantum simulator," has been proposed, in which quantum mechanical particles such as atoms are assembled into an artificial strongly correlated system whose properties are known and controllable. The latter is then used to simulate and understand the properties of a different strongly correlated system whose properties are not known. The team has now developed a completely new quantum simulator for the dynamics of a strongly correlated system of more than 40 atoms within one billionths of a second. 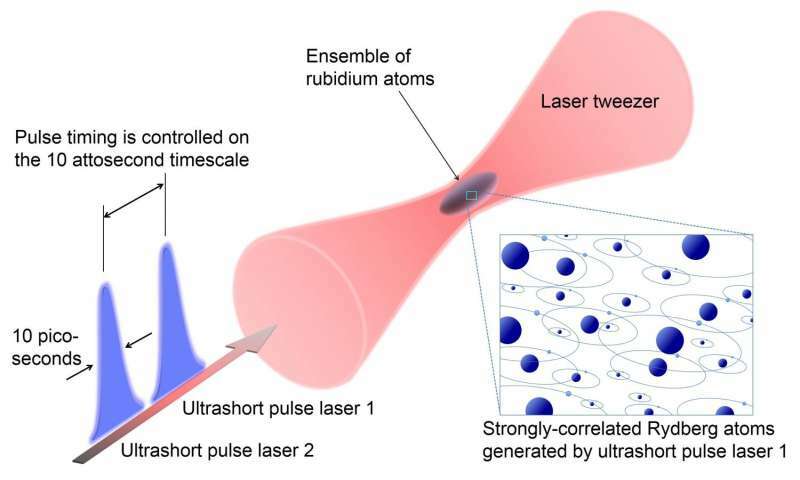 This has been realized by introducing a novel approach in which an ultrashort laser pulse at a pulse-width of only 100 billionths of a second is employed to control a high-density ensemble of atoms cooled to temperatures close to absolute zero. Furthermore, they have succeeded in simulating the motion of electrons of this strongly correlated system that is modulated by changing the strength of interactions among many atoms in the ensemble. This result will be published in Nature Communications on 16th November 2016. Would it not be simpler to start with atomic structure in the simulator?